My first baby came home and we were so proud, so in love, and so blissfully naïve. I remember all the wonderful things about those first 2-3 weeks home with my beautiful little labor trophy. Recently, I finished the third week home with our second little boy. This time I’ve remembered and endured a few other things that I completely forgot about that happen in your first few weeks home. Obviously, since these are much more unpleasant I selectively chose to forget them. I think it would be worth the reminder to a Nesting 9 Month Mommy so she can prepare. Here we go! When you drive away from the hospital with your new bundle, the focus is obviously all about baby – especially for family and friends. It’s not that no one cares about mom (my husband is especially great about this and makes me feel amazing every day) but when mom comes home from the hospital she has a lot of new needs, too! 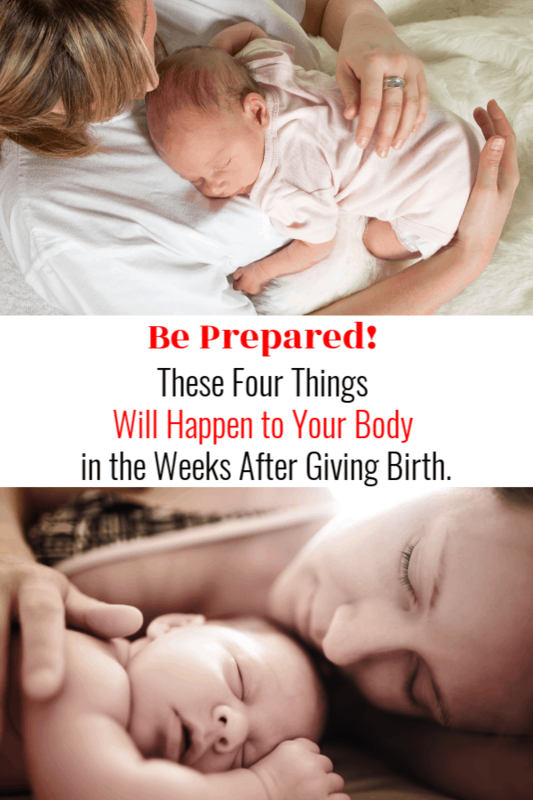 A new mom is still dealing with the effects of the birth for about 2-3 weeks! This often puts her in a very fragile mood and can lead to emotional eruptions. So, be careful, family, when expecting the new mommy to be social or entertain mass visitors. It might get a little bumpy! Not only are you expecting mom to load up that new baby, but also to load up all her new baggage and then put on a smile. Read on for more detail about each of these crazy and amazing things that happen to your body after giving birth. This may come as a huge shock, but during pregnancy your body produced a some new hormones and increased others to develop your bundle of joy. Not all of those hormones came rushing out with the baby. Instead, all those hormones are still inside plotting a very secret and elaborate jail break that requires only a few to sneak out at a time. They don’t bother to be discrete once they have escaped, but rather perform a showy touchdown dance and some flagrant gestures once they’re out in the open. These hormonal celebrations of escape are not at all fun for people in the civilized world to see and might be perceived as a maternal meltdown, baby blues reaction, or even resemble a PMS episode. Moms: Prepare yourself for this by taking a deep breath whenever family pressures you to be social. I personally fail at this – my own advice – and spiral into a hormonal sob-story. So take it from me and prepare yourself now to deal with your own, loving family. If you can, this Family Portfolio idea might help ease the family pressures for birthday week. Good Luck! Family: Please don’t hold any eruptions against the new mommy. Trust me, you’ll regret it if you provoke an eruption! She doesn’t need the extra stress. Drop off a casserole and let her be. With all of those hormones sneaking out of your body like little convicts you’re going to experience a few side effects on the outside. First, your skin might itch like crazy. My face specifically drives me up a wall these first few weeks. It actually kept me awake at night feeling like I had spiders crawling on me. Yuck! Second, you’ll break out. Fiercely. All that beautiful, glowing skin you’ve been showcasing for 9 months? Gone. In fact, you might look a little pale, have puffy eyes with dark circles and some new blemishes thanks to the hormone “breakout” situation. Total. Facial. Betrayal. Moms: Prepare yourself for this by getting some awesome new concealer and face wash during your ninth month of pregnancy. Who doesn’t like new cosmetic goodies? Plus, you could probably use the retail therapy. Family: Awesome idea for a baby shower gift: Gift Cards to her favorite cosmetics store! Oh, and don’t ever ask, “What’s going on with your face?” – especially in public. Well your body, had to undergo some major remodeling to accommodate a second person. Your ribs, hip,s and all of these wonderful little “puzzle pieces of PAIN” that doctors call ligaments have to MOVE. Sounds crazy when written right? Your BONES are MOVING inside your body to a different location than they were in before. What other life situation requires that without a cast? The remodel itself, which takes 40 weeks, is painful enough, but then after baby comes out your body decides to put all those puzzle pieces back to their original (not exactly) place – all in two weeks’ time. I think the pain of this is accurately described as an internal game of Jenga being played inside your lower back. The tower falls over every single time you sit down, stand up, bend over, reach for something . . . you get the idea. You know what an umbrella goes through when the wind blows it inside out? Yes, I imagine this feels very much the same. But rest assured it only lasts about 3 weeks. And then, like I said in the intro above, you forget all about it. Moms: Prepare yourselves for this orthopedic transition by getting one of those electric heat pads , reusable ice packs , and some microwave heat packs with nice scents like lavender. Family: Help mom by offering to help her up out of chairs, holding doors open for her, and offering to hold baby. Offer to get the car seat out for her, carry in the groceries, etc. Mom still shouldn’t be doing the heavy lifting even though the Jackfruit is on the outside. Just like the hormonal jail break mentioned above, all of that luscious, thick hair you grew on your head during pregnancy jumps ship like someone yelled “FIRE!” and dives off your head every shower. This one takes a few days to catch up to the whole “no longer pregnant” situation. But once the hair catches up to the concept, it obviously feels like it has to make up for lost time by all leaving at once! Don’t be terrified when you have handfuls of hair come out in the shower. I mostly lost little short hairs – the ones that look like they were only growing for about 9 months. “Pregnancy hair”, if you will. My hypothesis is that I only lost the “newest hair” which was produced during pregnancy, but none I had before. To my knowledge, my hair doesn’t seem any thinner overall than it did before pregnancy, but now it’s thinner than it was during pregnancy. Moms: Prepare for this by simply not freaking out when it happens. Also, plan to wear your hair up and pulled out of your face for the first two weeks. If you’re breastfeeding this is better anyway. One less thing to wrestle with. While you’re shopping for some new post pregnancy cosmetics get yourself that hair product you’ve wanted to try but never bought for yourself! I’m waiting until I’m “back to normal” and ready to leave my house to face the public before I dive into my fancy new stuff. There is no better way to counter the self-consciousness of your new mom body than to feel ultra confident in your new skin and hair! Who doesn’t feel awesome after a salon makeover? Obviously your mental and emotional health are still riding high after birthing an amazing bundle, so you’re good there, but physically, new products always help! I have started a whole Pinterest Pin Board dedicated to my new Mom Body and how proud of it I am! You should follow along! Family: Get mom some cute hair elastics (I got leopard print ones for myself) and some awesome new hair products! My sister got me this awesome new leave-in conditioner that I can’t wait to use! Here is a great graphic from Healthline that outlines the changes in your body in the weeks after birth. Best of luck to you in your labor and delivery adventure, but I know it will all be okay for you and that little bundle will be perfect! I am much more concerned for you (because I’m empathetic) for the first two weeks home. It can be rough, for all moms, first time, second, and more. Your body is amazing and goes through a lot. Make your recovery as comfortable as possible for yourself by knowing what to expect and planning for it ahead. You’ll do GREAT! Thank you for reading! Editor’s Note: This post was written by Kandice, owner of Green-Eyed Girl Productions and a Coordinating Blog, The Vintage Event, and her personal blog A Cotton Kandi Life. You can find out more about Kandice by following her on social media on Pinterest and Facebook. Get support for parenting and connect with other moms – join us in our private Facebook group for Positive Parenting Support. Wanna know how I save up to FIVE hours each day?